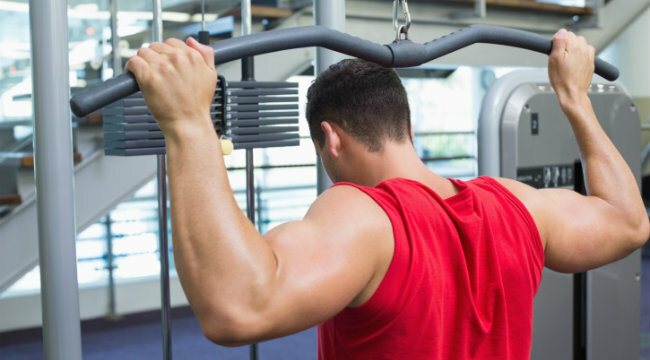 By combining three different types of pulldowns you'll maximize lat growth. The lats are generally a tougher muscle group to feel during a workout. One reason is that almost every exercise you do for bigger lats is a multijoint move involving numerous other muscle groups. Another is that it’s not one of the “mirror muscles” you can easily see like the pecs, biceps or abs, which creates something of a disconnect with this large back muscle. Extended set training is a technique that involves variations of a single exercise to make the movement less difficult, which allows you to continue the set with the same weight and take your muscles far beyond their normal point of fatigue. Each successive variation of the exercise places your body in a biomechanically stronger position than the previous one, making the weight feel easier so that you don’t have to lighten the load. To do extended sets on pulldowns, start off with lat pulldowns behind the neck. Then, when you reach muscle fatigue, immediately switch to wide-grip pulldowns to the front, an easier version than behind the head. Once you reach failure again, finish the set off with reverse-grip pulldowns, the easiest variation of the three. By the time you finish your first extended set, you should already feel your lats begging for mercy. Wait until you complete all three sets in this manner – talk about pain. NOTE: Be sure to use wrist straps when attempting the extended set. It will prevent your grip from being the weak link, which will allow you to more effectively take your lats to failure and feel a stronger contraction.